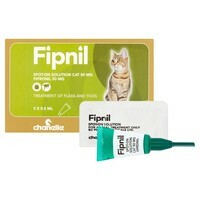 Fipnil for Cats is an easy to use spot on solution for the treatment of flea and tick infestations. Fipnil Spot-On Solution has a persistent insecticidal efficacy for up to 5 weeks in fleas and can be used as part of a treatment strategy for Flea Allergic Dermatitis, where this has been diagnosed by a veterinary surgeon. Although no immediate killing effect against ticks has been demonstrated, the product has shown an acaricidal efficacy for 4 weeks against ticks. If ticks of some species (Dermacentor reticulatus) are already present when the product is applied, all the ticks may not be killed within the first 48 hours but will be killed within a week. Do not use in kittens less than 8 weeks old and/or weighing less than 1kg.